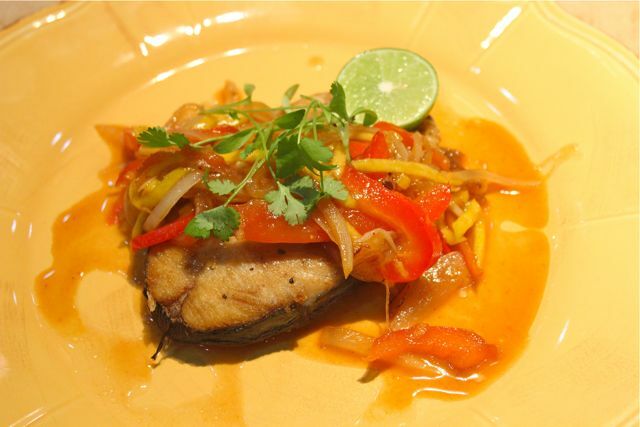 Upscale pinoy escabeche. :) That’s the best way for me to describe it. And it was wickedly good. We had some yellow fin tuna fillets left over from some kinilaw or ceviche experiments earlier the same day, so I added some olive oil to a pan, salted and peppered the fish, and seared it in a hot pan until lightly browned, and turned it over. Remove the fish as soon as you feel or see that it is opaque all the way through and set this aside. 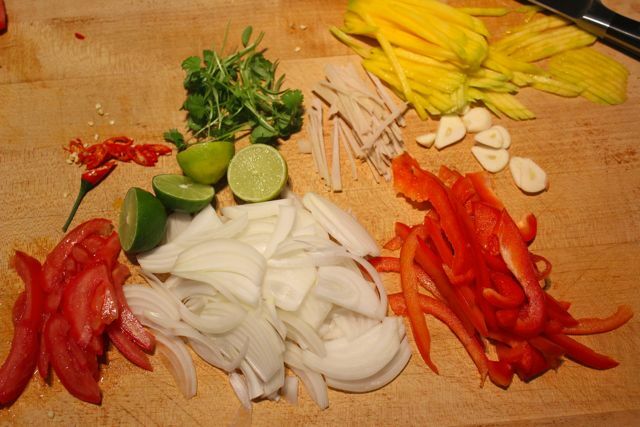 Meanwhile, prep the stuff for the “sauce” — some sliced onions, ginger, garlic, red bell bell peppers (got great ones at Tosana Farms, tomatoes, julienned apple mangoes, sliced siling labuyo or chilies, mini-coriander for garnish. Into the same pan you cooked the fish, add the onions, garlic and ginger and saute until fragrant. Add the tomatoes, peppers, and chilies and saute a minute or two longer. Add a couple of tablespoons of homemade or store bought tamarind puree, a bit of water (you could add a bit of cornstarch with water for a slightly thicker sauce), a teaspoon of muscovado sugar and some good fish sauce. Add a touch of kikkoman or salt and pepper to taste. Add the mangoes just before you are ready to take this off the heat. Garnish with chopped coriander, or in this case mini-coriander from Malipayon Farms. Ladle on top of the fish and serve immediately. I also fried up some tanguigue (spanish mackerel) in the same manner as the tuna and also ladled this sauce over the fish. Both versions were delicious. 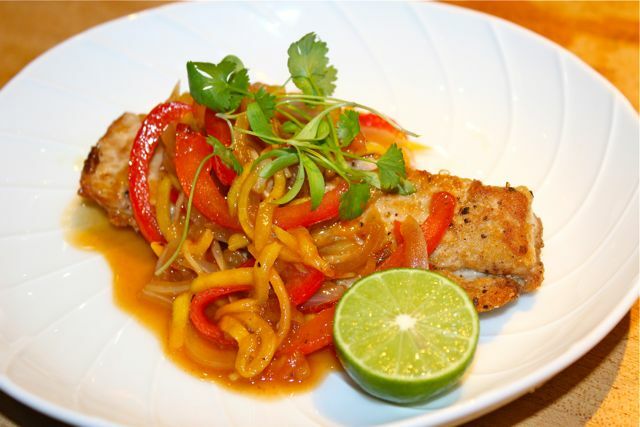 The thai-style inspired sauce was sweet, piquant, savory and a perfect foil for the fried fish. You need copious amounts of rice with this dish. So simple, so easy to make, and the results totally worth the effort. Perfect for people avoiding meat on Fridays during lent, or great to eat at any other meal during the year. With rice, bread toast, potato or….? One of the best crab dishes I’ve ever had was flavored with tamarind, in the Mekong Delta years ago. Maybe something for you to try, too, MM? 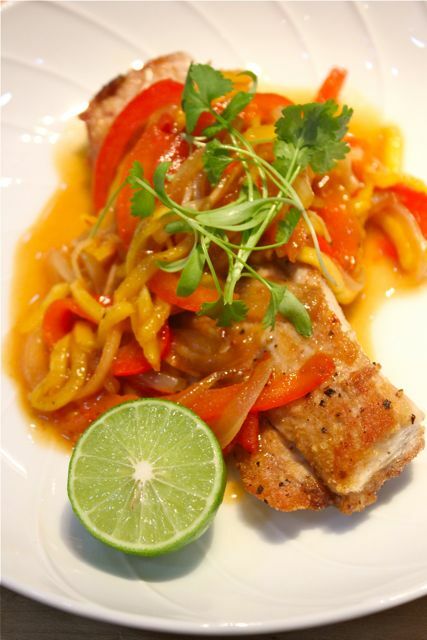 Hhhmm another simple way to dress up a simple fish dish and healthy for the heart too! Ayy sarap, sarap. Ganda rin ng photo. MM…if you have anymore ripe sampalok, I think you will like tamarind-balsamic vinegar. I wanted to use white balsamic but didn’t want to go out in this rainy weather so I used regular. balsamic vinegar which I had in the pantry. I have to say it turned out really well..made a glaze out of it with shallots by reducing it to syrupy consistency and napped it over seared scallops. Masarap! We have ripe sampalok from Thailand at the grocery stores year round so I think this will be bottled for this coming Christmas to be given away. Uyy something new.. I never thought there was more than two ways of using tamarind! I’ve only just used it for sinigang and as snack (esp the ones from Bangkok)! So did all the tamarind experiments necessitate frequent trips to the loo, MM? (Which is what I need for eating too much! Thank you for sharing this interesting recipe. Looking forward to trying it! With so many allergies in our household, tamarind has been a substitute whenever tomatoes are called for in a recipe. It has worked well for us, with ginisa dishes, even with fish taco, though I have yet to try it with pasta sauce…hmmmm I wonder. Looks good…reminds me of a Thai dish with pampano. Having serious dayap envy once again :-) Sister and I were in Bataneswith the Museum Foundation last weekend and had the most wonderful Ivatan food which included a very tasty escabeche of snapper. Seeing your version is bringing back some incredible visual memories of a FANTASTIC place to visit. have you been? When melons are in season, MM, and you have prosciutto, a nice way of making pica pica is to get a some pipettes, fill it with a drop of tamarind balsamic vinegar, then use then thread the melon and prosciutto. Another one is if you want to use your upscale escabeche as an appy, cut the fish to serving appy pieces, and thread them into the tamarind sweet sour sauce filled pipette. bettyQ: the pipettes I know from chemistry class are either made of glass or plastic. How do you squeeze the tamarind out of the pipette? or do you blow it / shake it out? play with it with the pica pica? some fun production I imagine…..just wondering. hi MM! Thanks for showing the portions of your ingredients before cooking them. this gives me an idea as to how much i need to prepare. (sabi ko nga lagi, i’m not friends with the kitchen, but i have to learn to depend on myself here abroad). OK, doc….mwhahahahah a….very funny! Anyway, it is tamarind balsamic VINEGAR …..If Footloose or Silly Lolo saw that comment, I can only imagine what they were going to say! Yes, it is truly a fun way of eating the appy…plastic graduated sizes available on e- bay if you are not near a lab equipment supplier. it always draws ooooohs and ahhhhhs whenever I use pipette as a vessel for pica pica. bettyQ: Still not getting it. How do you get the shot of balsamic vinegar out of the pipette? Do you need a rubber bulb to blow out the vinegar or blow it out with your mouth? rather uncouth I would say and I’d be confused which to do first, blow the vinegar into the pica pica or get the pica pica into my mouth? First…better be in beach attire when you eat this…just kidding! just like eating something on a toothpick, say a melon ball…as your take a bite of it, gently squeeze the plastic blob…we are not talking a turkey baster, doc!…sorry…can’t help it! Ok…but maybe if this was served to a socialite…prim and proper, she probably would slide the prosciutto wrapped melon ball with a fork and squeeze a drop of the tamarind balsamic vinegar over it….but that’s not fun! You have to hold the pipette in a way that the pointed end is up and the blob	is on the lower end such that as you slowly slide the ball off the pipette, with your teeth biting into your aperitif, gently squeeze the pipette, slowly releasing the dressing into the ball of whatever. Hopefully the liquid does not squirt on your face in the process, but that is the fun part of it….. your fine motor skills needed! Let’s see Paris HIlton or KIm Kardashian do it. You are something else, bettyq! hahaha..i’d hate to end with a squirt of balsamic dressing on my dress, or worse, on my face! so that’s what they do with pipettes nowadays!